Maslow’s hierarchy of needs is a popular theory that explains how we achieve psychological maturity by attending to basic needs before moving up the hierarchy toward self actualization. The theory is represented by five levels of achievement arranged in a pyramid so that the lower levels serve as a foundation for the levels above. There are five levels of needs in Maslow’s hierarchy: Physiological, Safety, Love and Belonging, Self-Esteem, and Self-Actualization. These five levels of need can also be translated so they apply to your organization and the needs for consistently producing content. When applied in this manner, the content hierarchy of needs can help lay out a framework for a more organized approach to content strategy and digital marketing. The five levels in this case are: Commitment, Reliability, Community, Responsibility, and Delight. Any organization must begin by building a solid foundation for producing and managing its digital content. This means that leaders must be engaged and resources must be dedicated to the effort. It is also important to have identified primary goals and business objectives for your content-based projects so that you can measure your progress in using content to advance the organization’s mission. This level aligns with the first two phases of our Sustainable Content Ecosystem — Phase 1: Assess and Phase 2: Devise. 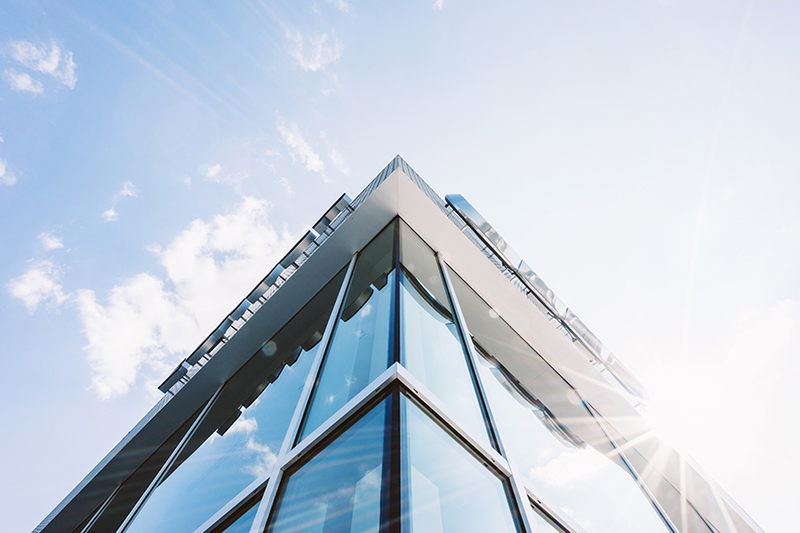 Moving up the pyramid, the organization needs to capitalize on its leadership engagement and resources to ensure that content is published on a regular basis, that it uses a consistent voice and editorial style, and that the content is accurate, engaging, and unique. This can be a challenge for many organizations, but the second and third phases of the Sustainable Content Ecosystem can help — Phase 3: Implement and Phase 4: Document. The next level of the pyramid is using content to create a vibrant online community to help you further your mission. To build community, savvy organizations use social media posts to drive users to your website and encourage them to explore your programs. A consistent flow of quality content is required, as well as regularly scheduled posts to social media that will share enticing pieces of content and draw interested parties back to your site to consume the full content. Other strategies that come into play when building community in this manner are the content hub, onward paths, and repurposing content. As we near the peak of the pyramid, we come to the need for responsibility. Any organization wishing to use content to strengthen engagement with members, funders, and advocates needs to be responsive and accountable to its users. This means actively managing your online reputation and replying to comments, suggestions, and complaints. It also means maintaining an ongoing commitment to meeting the needs of the three lower levels in the pyramid. This is the pinnacle of achievement in content strategy and the peak of the hierarchy of needs. 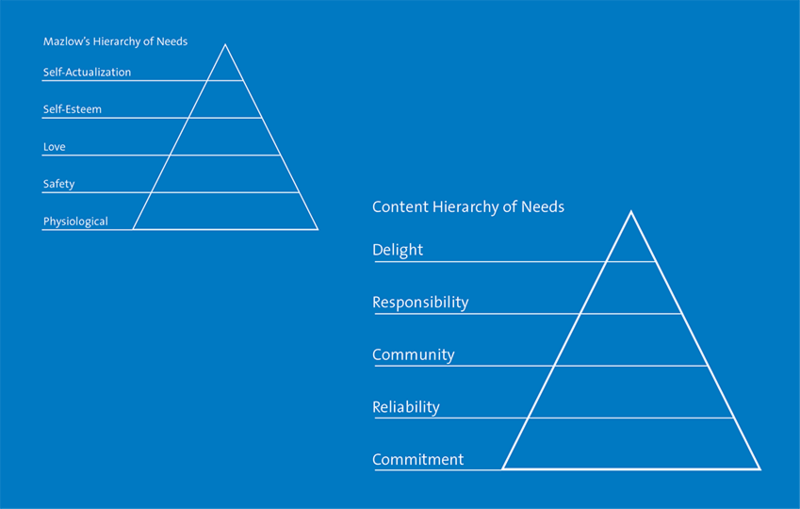 To create delight for your users, an organization must successfully master all four previous levels in the pyramid by putting in place a solid foundation for digital content management, consistently publishing expert-level content, fostering a sense of community within your audience and being responsive and accountable to your users. Creating delight also requires an extra level of creativity and engagement, which can manifest in various ways and is addressed in a separate post here. This content hierarchy of needs is a valuable framework for learning to better manage your organization’s digital content, and we love helping folks apply this in their everyday work. To learn more, download our manual: Building a Sustainable Content Ecosystem, or get in touch for a free 30-minute consult to help figure out the next steps in becoming your own organization’s content whisperer.